Years ago I was diagnosed with diabetes and after years of learning everything I can about the body, traveling the world teaching others how to live well & happy with the disease, and being a tireless advocate for those living with and caring for those with diabetes, I am proof positive that you can have a full and healthy life despite this diagnosis. I travel the world helping health care providers better serve their diabetic patients. I speak to those living with diabetes and I share my journey and my commitment to live happy and well in the hopes that I will inspire just one more person to embrace the disease rather than feel victimized by it. I give keynote addresses and host workshops for corporations, governmental agencies and health care organizations all over the world. I play hockey every chance I get. I am the former chair the Canadian Diabetes Association’s National Advocacy Council, and I lead advocates in getting coverage of insulin pumps and test strips in provinces across the country. I host the Sugar Free Shawn Show where I bring in experts to share their best advice on living well, with or without diabetes. That’s because I care about you and the people you care about. Through my TV show and live speaking engagements, you’ll learn how to live well and happy with diabetes and then spread the love to those who need it most. Learn the uplifting story of how Shawn took the diagnosis of type one diabetes and a history of Huntington’s disease in his family and turned it into leading his dream life. Shawn will share exactly how he did it, and how YOU can apply the lessons to your life immediately. How to move into ACTION immediately. You will leave feeling inspired, and have tools to apply to your life immediately. It was unprecendented, yet necessary, to include Shawn Shepheard as the first male keynote speaker at a DiabetesSisters Weekend for Women Conference. Shawn related with everyone in attendance, providing inspiration, humor and attainable goal-setting to our community. Shawn's great disposition, pristine preparation, and eagerness during our entire weekend - not only during his session - made him standout as an integral part of our event. Thank you, Shawn, for sharing of yourself - successes, challenges, good, and bad - those shared experiences make us better equipped to manage diabetes better! Shawn is fantastic as a speaker on diabetes and making life-changing choices. He is so positive, and his story so authentic, that audiences are immediately engaged in his presentations. Shawn challenges audience members to find their 'why' and make the changes they need to in order to live well, with or without diabetes. I would highly recommend Shawn for your event! It’s Christmas morning. And instead of sitting under the tree opening presents, you’re sitting in a doctor’s office absorbing the news that you have Type 1 Diabetes. Probably not the best gift you’ve ever gotten. If you’re Shawn Shepheard, you decide to squeeze every last drop of joy out of every moment you have on this planet. And then, you go back for seconds. 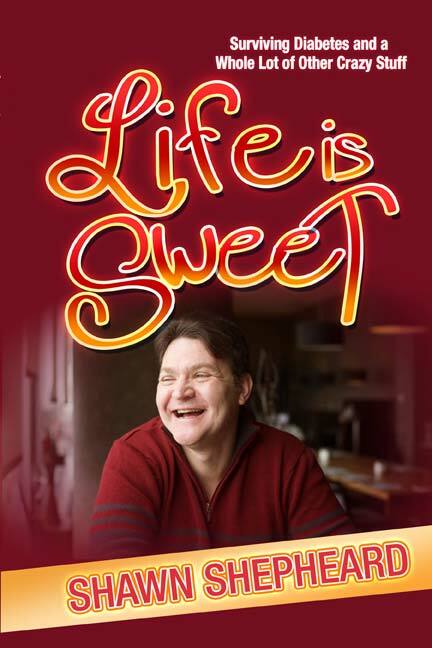 “Life is Sweet” is a look at some of the most heartwarming, hilarious and flat-out insane moments of the life of internationally-known speaker and star of “The Sugar-Free Shawn Show,” Shawn Shepheard – a life lived right up to the edge, and occasionally, over it. The time he took over a good friend’s radio show. And bombed. Badly. The time he got a roomful of stuffed-shirt business execs to shake their booties to ABBA’s “Dancing Queen” – and accidentally launched a company tradition. The time he went shoe shopping for his first pair of high heels. The time he shot the first episode of his brand new show…with a bunch of zombies in the background. Packed with real-life stories, anecdotes and observations, “Life is Sweet” will inspire you, surprise you, and most of all, make you laugh till you cry. But sorry – tissues are not included.